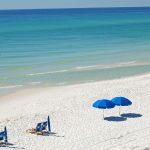 The 30A and surrounding area has so many things to do for all ages! We’ve made a list of the Top 10 things to do regardless of the time of year you come. For specific seasonal events, please click here for our featured event listing. The list is in no particular order, but are all things we have experienced personally and highly recommend to others. 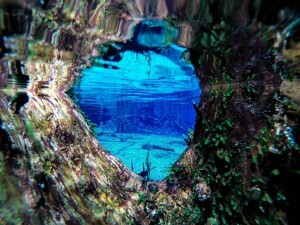 Cypress Springs is truly one of the most remarkable places we have ever visited. Our first visit was through a touring company called Walk On Water, and they did a great job with the tour. This company came highly recommended to us, and we consistently recommend them to others. They bring everything for you – paddle boards, lunch, snorkeling gear, and life jackets – so you don’t have much to plan. The trip takes about 1/2 a day whether you go alone or with the touring company, and is a great way to spend some quality family time without the interruptions of electronics! Fair warning – the water is very cold, but your body quickly adapts and the shear beauty makes you forget about the temperature….that said, sunny days are definitely more welcome at the springs :). The pictures from our gallery can’t convey the beauty of Cypress Springs. I promise you won’t regret taking this excursion and you will want to come back for future vacations! Click here to view gallery of Cypress Springs. Deep sea fishing in the Gulf of Mexico is a fisherman’s dream. We have gone several times, and every time we have caught the limit! Most of the captains have their ‘secret’ spots where they know the fishing will be fruitful. They will ask you what type of fish you prefer to catch and target those areas if you have a preference. Obviously, with the Destin and Panama City Beach Harbours both close by, there are many great experienced captains to choose from. There are also captains that launch right off 30A in Grayton if you prefer to take a shorter trip. Out of Destin, we have used Captain Mike with Silver King several times and have had great luck. He has many years of experience and knows the best fishing spots, and he is just a really nice guy. We like to take a fishing trip toward the beginning of our vacation and enjoy the fruits of our labor for several meals during the week. Captain Mike’s crew will clean and filet all the fish and place them in handy ziploc bags. We like to take a few filets to a nearby restaurant where they ‘cook your catch’, so we can enjoy some fresh seafood right away. Of course, you can always fish right from shore at the beach access or in the lake behind the house if you don’t really want to leave Daniel Dunes. 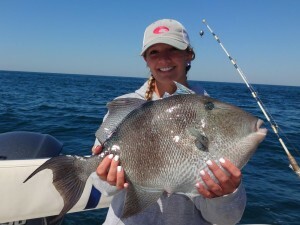 Click here to view gallery of Deep Sea Fishing. The Seaside Farmer’s Market held every Saturday throughout the year is the best place to get all your fresh produce, dairy, meats, and baked goods for your vacation. Local farmers setup at the farmer’s market from 8 a.m. to noon each Saturday, and it’s a popular attraction for locals and visitors. There are usually musicians performing in the amphitheater, so the kids can enjoy playing in the grass listening to music while you shop! Seaside Farmers Market is on a mission to educate the public about sustainable practices by providing a well-rounded, green living experience. Vendors offer farm fresh, locally grown produce, homemade baked goods, beef from happy cows, heirloom seeds, artisan breads and cheeses, organic eggs, and preserves, to name a few. 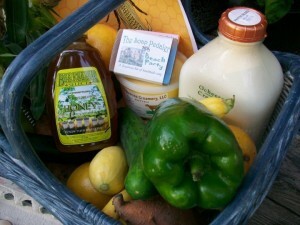 Click here to view gallery of Seaside Farmer’s Market. So, normally I wouldn’t even think of putting a specific restaurant on my Top List, but Crust Artisan Bakery is more than a place to eat – it is a dining experience! This is a local favorite, and we try to go at least once every time we are in town. The food is that good! The menu changes daily based on what the chef finds at the daily market, so everything is fresh. 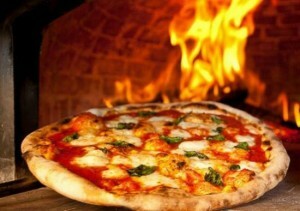 Italian dishes are the chef’s specialty, but there are always other types of dishes on the menu as well. The local owners, Kim and Mark, are hands on to ensure all guests receive the ultimate dining experience. They were even featured on Emeril Lagasse’s Florida on the Cooking Channel. The restaurant is small, so definitely make reservations, and it is BYOB so bring your favorite beverage to enjoy with your delicious meal. They also make the best pastries that are sold in various shops along 30A and at the Seaside Farmer’s Market – our favorite is the Almond Croissant! Click here to view gallery of Crust Artisan Bakery. For the more adventurous members of your group, we recommend flyboarding with Power Up Water Sports in Destin. The owner is the main instructor and he can usually get people up within 5 minutes. I just noticed on their website, they guarantee you are up within 10 minutes or your flight is free, so what have you got to lose? Our kids have done this a couple of times and keep wanting to go back again. The owner’s son is one of the best flyboarders in the world – some pictures of him are included in the gallery below. This is definitely a bucket list experience! 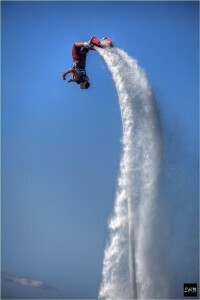 Click here to view gallery of Flyboarding. Kids getting bored and looking for a fun activity? Creating beautiful sand sculptures is a great way to get the family together and you have a great piece of art to admire! 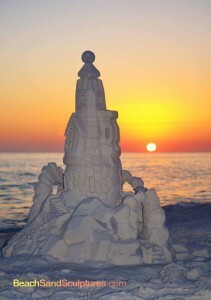 The owners of Beach Sand Sculptures do a phenomenal job bringing families together to create wonderful sculptures. They bring all the tools necessary and will come to your location. Kids and adults alike have a great time collaborating to create their own master piece. Click here to view gallery of Sand Sculpture Lessons. If you are looking for a fun activity on a rainy day, Shardworx is your answer! Mary Hong is a local talented artist who makes amazing things with glass shards. She is truly an inspiration to watch as she creates one of a kind pieces – and, pictures don’t do her work justice – you must see her art in person! Her studio is filled with her own master pieces that you can purchase, or you can make your own in her classes. The Shard Shop has classes throughout the day all year long where you can work your own magic making a piece of art from shards of glass. Mary supplies all the materials necessary so all you need to bring is your imagination, but there are plenty of pieces hung throughout the space for inspiration. The pieces students of all ages make are not only beautiful, they are priceless pieces that provide great memories of your beach vacation. Click here to view more photos of Shardworx. 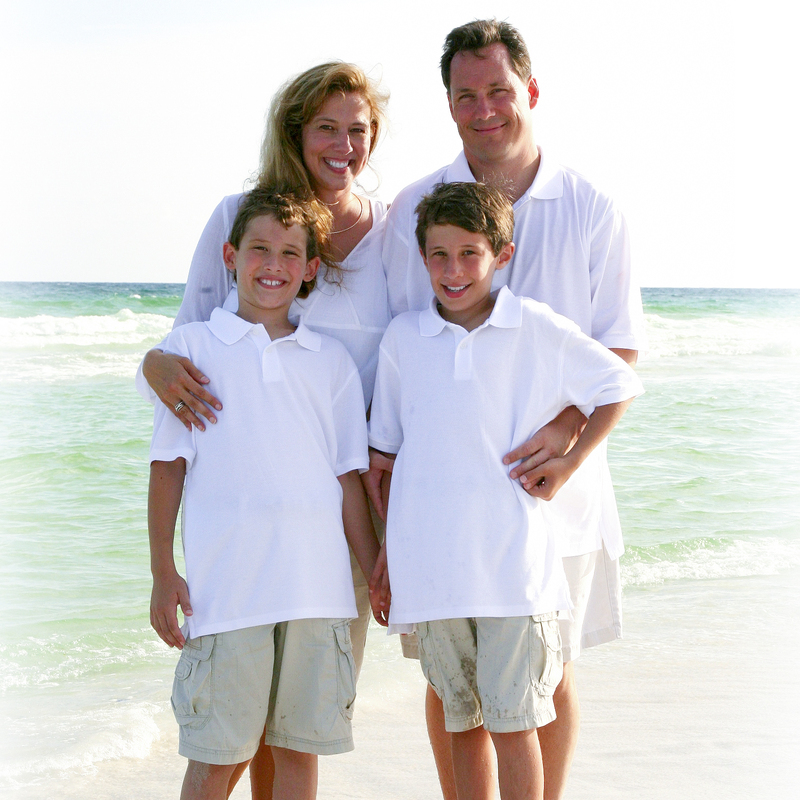 There really is no better time to get some family photos done than while you are on your beach vacation with some of the most beautiful scenery in the world! Make those memories last forever, and take advantage of a time when everyone is well-rested, healthy, and happy. The backdrop at our beach access alongside Deer Lake State Park is the perfect place to take some great photos of your group, and there are many talented photographers in the area that will come to your location. Whether you hire a professional photographer or take the photos yourself, don’t let this opportunity pass you by! 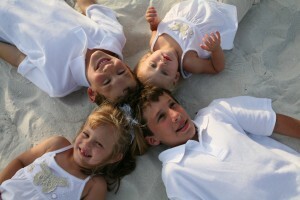 Click here to view gallery of Family Photos on the Beach. Whenever anyone asks us what one of our most favorite activities to do at the beach is – the first thing that comes to mind is kayaking in the gulf. That’s why we have two 2-seat kayaks and plenty of life jackets in all sizes for our guests to enjoy this activity at no extra cost. The photo above shows our guests with some of the watercraft having a great time! In the morning, the water is usually calm and is perfect for a morning cruise when you have a good chance of seeing dolphins swim alongside! When the gulf waters are clear, you can see all the way down to the ocean floor even past the sandbar. Bring your waterproof camera or GoPro and get some great shots above and below the water’s surface. Our son likes to take fishing gear and fish from the kayak as well. Getting out on the water brings about a sense of peace and offers a different perspective of the area. We really want our guests to enjoy this experience! 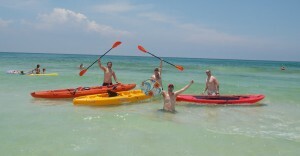 Click here to view gallery of Kayaking in the Gulf of Mexico. 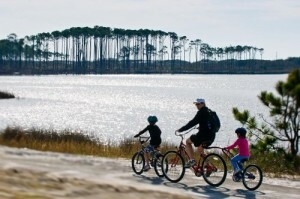 Another great family activity is to bicycle on 30A. There is a 19 mile paved bike path called the Timpoochee Trail that parallels the entire length of scenic highway 30A passing through all the quaint beach communities. The trail takes you over coastal dune lakes allowing you to stop along the way and take in the unique beauty of these rare lakes. From Daniel Dunes, it is only a 3 mile bicycle ride to Seaside or Rosemary Beach. Both of these communities have great shopping and casual dining to enjoy during your break from biking. We often bike to the local Publix grocery store when we need to pick up a few items just to take in the fresh air and beauty of the area. We have about a dozen bicycles in the garage free for our guests to use, but if you need more bikes or child carrier trailers, there are several vendors who will drop off the gear right to the house. Click here to view gallery of Cycling Along 30A. My family enjoyed an entire week at the Daniel Dunes vacation home. There are 14 of us in all including three generations ranging from 68 years old down to one year old. There are four separate sleeping quarters including a little apartment that was perfect for my son’s family who have a baby and a toddler. We used the kitchen to cook constantly. It is well stocked and the full sized oven cooked our Thanksgiving turkey. All of the toys in the garage were great. My 16 and 13 year old grandsons thoroughly enjoyed the paddle boards and kayaks, as did their fathers, mothers, uncles, aunts and grandparents! We went crabbing and actually caught some blue crabs. We used the bikes to go back and forth to the little town of Seaside where we saw a parade, ate delicious oysters and ice cream. There is also a Publix food store within minutes of the house. The home is very nicely furnished, with tons of sheets and towels available. It’s also very quiet and we listened to the surf gently breaking every night. The beach is absolutely amazing with white, soft sand and clear blue water. We saw schools of Manta Rays who were feeding in the surf right off the shore, and there were plenty of shells. We all had a wonderful time and would love to go back one day!